Everyone is entitled to his or her own opinion of course, and my opinion is that this sort of treatment of food allergies in mainstream Children’s Entertainment is irresponsible and dangerous. Let’s look at a few counter arguments and we’ll talk about why. We aren’t giving kids enough credit. They recognize that a battle between a man and a rabbit isn’t real. Real or not, kids emulate what they see on film. My own boys have acted out bits of nearly every movie they’ve ever watched. And when a movie captivates the imaginations of large groups of children, complicated games with multiple players will spring up on the playground, with everybody playing a different part. Kids do copy what they see on film–the difference is that most cartoon violence is ridiculously impossible. The rotten things characters do to one another in children’s movies are things kids cannot emulate outside of their imaginations. Filmmakers seem to recognize that real weapons (and real death caused by real weapons) don’t have a place in light-hearted children’s entertainment. Think about it. The most “real” fighting that characters do in children’s entertainment tends to be martial-arts-style punching and kicking. Beyond that, characters shoot each other with with freeze rays, lasers (or laser vision,) and other fancy weapons that don’t really exist. They attack each other with robots, trained animals, magic, and other ridiculously impossible contraptions. They catapult one another through the air, launch them into outer space, and inject them with drugs that make them go crazy. The only “real” weapons tend to be wielded by bad guys with horrible aim and who are completely unmatched against their superhero counterparts. When kids play out what they’ve seen on screen, they can use props or just their imaginations, but they can’t actually do any of these things to one another. Except when food allergies enter the picture. 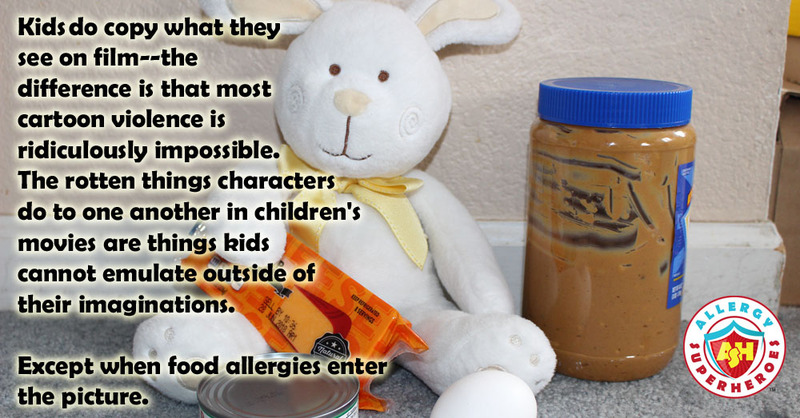 And this is the biggest problem with this sort of portrayal of food allergies. Allergens are not restricted substances. It’s ridiculously easy for children to get their hands on foods that can hurt a classmate, even if certain foods have been banned from the classroom or even the entire school. And it’s ridiculously easy for someone with malicious intent (or even a dumb kid who hasn’t thought things through) to bring someone with food allergies into contact with their allergen. And the sad reality is that the resulting reaction, if not treated promptly and properly (and rarely, even when it is) can result in death. This argument may sound good at first, but let’s be honest–how many children will actually have that conversation with a trusted adult? 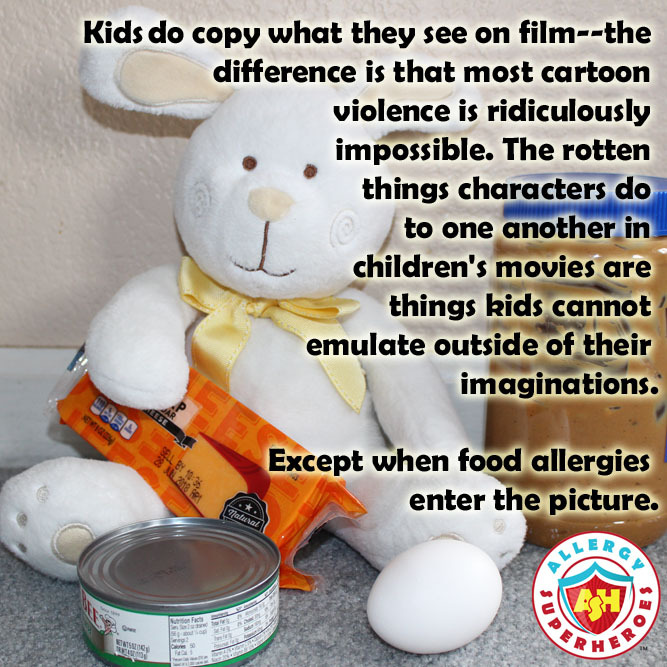 Food allergy families will likely discuss this scene if they see the movie, but food-allergic children are not the ones who need to be told that this behavior is unacceptable. Certainly food-allergic children may bully other children, but in this case these kids are far more likely to relate to the victim. Lots of allergic kids have anxiety about their food allergies, and many have already experienced food allergy bullying of some kind. They’re going to be more worried that someone may do this to them, not thinking of this as an idea to use on someone else. 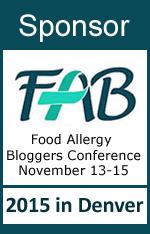 Food allergy families can and should discuss how to respond to food allergy bullying, of course. Now, will non-allergic families discuss this scene and how to treat people with food allergies? Some will. There are absolutely people without food allergies who still get how serious they are, and who will want to make sure their children understand that this isn’t funny. However, the majority of folks who don’t deal with food allergies probably won’t be moved to discuss this unless their children ask. And what’s more, the children who most need to have this conversation are the least likely to get it. These are the kids who may already be bullying kids regarding their food allergies, or who are considering doing so. They are the ones who don’t believe that anything bad will really happen, or who want to induce pain (though their understanding that it can cause death is usually not completely there.) And–this isn’t always the case, but–they are often the ones who hear their parents complain about allergic children being a major inconvenience. They don’t see their parents modeling compassion, they see their parents exhibit impatience and irritation (or worse) whenever someone else’s food allergies come up. These kids won’t hear their parents say “don’t do that,” in regard to this movie. Instead, they’ll hear their parents laugh, and will take that as tacit approval to belittle and bully those with food allergies in the future. This wasn’t bullying it was a battle, and anyway, kids do experience bullying. When bullying does happen in kids’ movies, it usually tends to be done by the antagonists to the protagonists. Many kids relate to being bullied, and this can provide the character with motivation to grow. 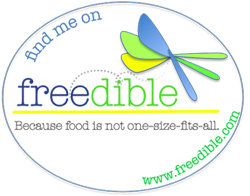 In the rare event that the protagonist is doing the bullying, it is usually at the beginning of the movie, and is used as a marker for the personal growth they are about to undergo. The fact that the protagonists of Peter Rabbit are the ones using food as a weapon makes the scene even more disturbing, and increases the likelihood that children will think this is okay. And as to this being a battle, see my first point. It’s happened in movies before. Really? Someone making a bad decision before is an adequate excuse for doing it again? And yes, people were offended by previous movies with poor treatment of food allergies. Your ignorance of their response does not mean it didn’t happen. I know someone with food allergies who thought it was funny, so stop whining. As previously mentioned, reactions to the film have been varied from food-allergy families and the non-allergic alike. Some people have higher levels of anxiety about their allergies than others–so while some kids will be horrified, others will barely notice. But normalizing violence using food allergies will lead to more people accepting it, which can lead to more people doing it, regardless of whether or not everyone is bothered. It’s ultimately up to parents to determine if they want their children to view this movie, or any movie. We all make different decisions on what content is or is not acceptable to us as parents, and at what age kids should be exposed to different kinds of movies. Based on what we’ve heard, we choose not to watch this movie. I don’t want to subject my kids to watching someone be attacked by their allergen, nor do I want to support this movie with our money. Characters with glasses can appear in movies without having them be intentionally broken, stolen, or the character being ridiculed for needing them–it has been a plot device, but except for experiencing bullying (above) this sort of humor isn’t very common these days. Likewise, characters can appear in wheelchairs without any additional drama than showing their difficulties in getting around. The word “retard,” originating for people with mental disabilities and then being used as a derogatory for being stupid, has gone out of favor to the point that young kids often haven’t even heard it. I hope for the day that Hollywood and the general public treat food allergies with respect for the serious and dangerous issue that they are, and that using them as a cheap punchline is no longer acceptable. 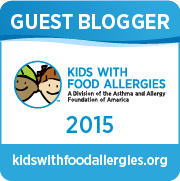 ← Previous Previous post: Top 40 Food Allergy Blog 2 Years Running! Eileen, you nailed it! I totally agree with you on why using food allergies stands out from all the other ridiculously impossible ways the rabbits try to harm the neighbour. I think instead of trying to get the scene cut out we should create a worksheet or something to go a long with the film about how to discuss this with your kids at home (and I don’t mean FA kids, since they already get it). Thank you for this article, it was extremely level headed and did a great job at explaining why this is so problematic. Thanks Kortney! 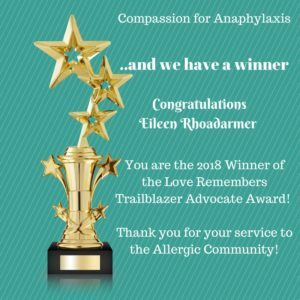 Yes I agree, I’ve been a bit annoyed by all the people who think food allergy folks are blowing this out of proportion, saying “just talk to your kids!” Trust us, food allergy kids already get it, it’s the rest of them we’re worried about! What bothers me about this movie is it acts like if you ingest an allergen, you simply pull out an Epipen, inject yourself and everything is okay. It often doesn’t happen that way in real life. My daughter has needed as many as 3 shots of epinephrine; Zyrtec, benadryl and hydrocortisone over several hours to make her comfortable; prednisone to try to prevent a second or bi-phasic reaction (which can be worse than the first reaction), and hours of time waiting for the reaction to get under control. Sometimes kids die when even the Epinephrine isn’t enough to keep their throat open. And to top it all off, most kids either do not carry or could not self inject.